Question: How do I castle in tChess? Question: How can I jump to the beginning or end of a game? Tap the in-game move list at the top right of the screen to bring up the full-screen move list. From there, you can tap any move to jump to that point in the game. Question: Why won't tChess let me make a legal move? Sometimes moves seem legal but aren't. Make sure you aren't in check, and make sure the move you want to make would not leave you in check. Question: tChess captured a pawn with a strange move. Help! There's a move in chess called en passant. Immediately after you push a pawn 2 squares, your opponent has the option of capturing that pawn (with a pawn) as if it had only been pushed 1 square. Question: What is a "stalemate"? A stalemate is when the side to move doesn't have any legal moves and isn't in check. Since he can't move, but hasn't lost, it is scored as a draw. Question: Why does the "confirm move" dialog box obscure the board when I'm playing a turn-based Game Center game? 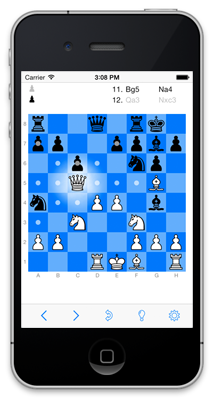 Question: Can you add a particular feature to tChess? I will consider every feature request. Please send it in an e-mail to tchessgame@gmail.com.